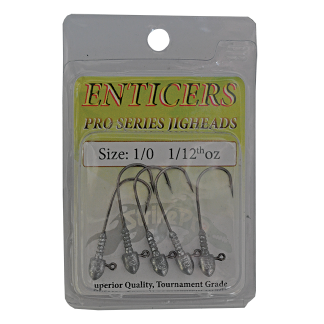 The Enticer Pro Series Jigheads feature the finest quality Black Nickel Chemically Sharpened Hooks with rounded bends to increase hook exposure and to increase hook up rates. They also offer a quality lead finish with a superb collar design and feature a flat end so your plastic fits snug against the head. All sizes feature 5 pcs per pkt. Available in sizes 1/12th, 1/16th, 1/20th & 1/24th of oz. Size #1 Designed to be used with Strike Pro Enticer Finesse Grub 2″ & other quality plastics. Available in sizes 1/8th, 1/12th, 1/16th & 1/20th of oz. 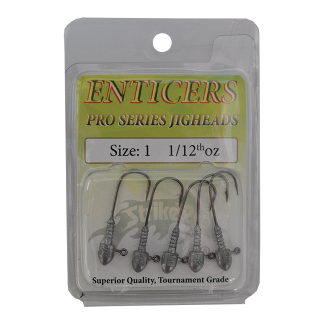 Size #1/0 Designed to be used with Strike Pro Enticer Finesse Bug & other quality plastics. Available in sizes 1/6th, 1/8th, 1/12th & 1/16th of oz. 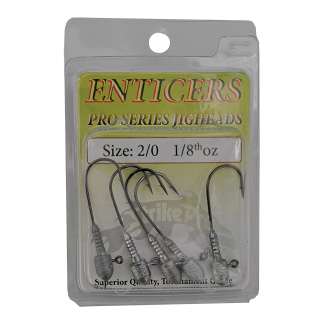 Size #2/0 Designed to be used with Strike Pro Enticer Finesse Grub 3″ & other quality plastics. 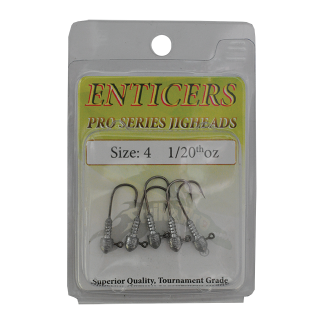 Size #4 Designed to be used with Strike Pro Enticer Crabs & other quality plastics.